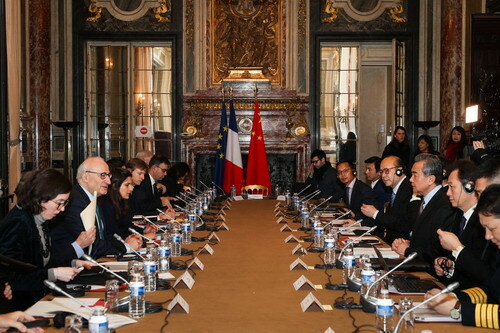 On January 24, 2019 local time, State Councilor and Foreign Minister Wang Yi and Diplomatic Adviser to the President of France Philippe Étienne held the 18th session of the consultation of the coordinators for the China-France Strategic Dialogue in Paris. Wang Yi said that as 2019 marks the 55th anniversary of the establishment of diplomatic relations between China and France, both sides look forward to taking it as an opportunity to deepen bilateral relations. Both sides should give full play to the role of China-France Strategic Dialogue and make overall plans for bilateral high-level exchanges, so as to push China-France comprehensive strategic partnership for sustained, stable and forward-looking development. Wang Yi expressed that China-France practical cooperation has played an important and positive role in boosting economic and social development of the two countries and global economic prosperity for a long time. Therefore, both sides should strive to accelerate the transformation and upgrade of practical cooperation. The two countries should continuously insist on the general direction of seeking more common interests under the principles of fairness, openness, mutual benefit and win-win results, so as to better realize intertwined and shared interests. We should further expand two-way trade and investment. China welcomes the French side to continue taking part in the China International Import Expo (CIIE) actively and is ready to import more quality French commodities such as agricultural products and food according to market demand. It is hoped that both sides will continuously provide a fair and open environment for enterprises of both countries to invest in each other. Since China is accelerating its pace in the opening up of financial sector, it is hoped that the French side will seize the opportunities of the new round of opening up of the Chinese side to continuously take the lead in financial cooperation between China and foreign countries. We should constantly promote project cooperation in such key areas as nuclear energy, aviation and aerospace. 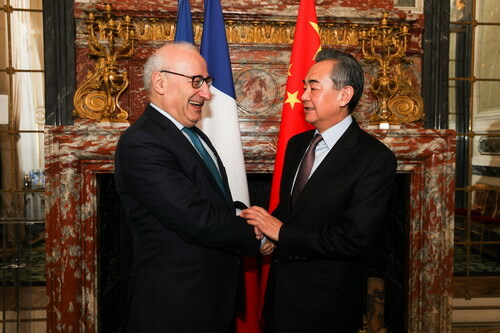 The Chinese side welcomes the French side to become an important partner of international cooperation under the Belt and Road Initiative in accordance with the principles of extensive consultation, joint contribution and shared benefits, and stands ready to strengthen the alignment of policies and development strategies with the French side and focus on advancing cooperation in third-party markets. The Chinese side is willing to align the Belt and Road Initiative with the Europe-Asia connectivity strategy of the European Union (EU), and advance cooperation under the Belt and Road Initiative in the spirit of openness, inclusiveness and transparency. Wang Yi said that people-to-people and cultural exchanges have always been the important impetus for the development of China-France relations. Both sides should take the celebration of the 55th anniversary of the establishment of diplomatic relations between China and France as an opportunity to commemorate the 100th anniversary of the Chinese work-study program in France, deepen bilateral exchanges and cooperation in culture, art, education, sub-national engagement and tourism, and further consolidate the public opinion foundation of China-France friendship. France was among the first countries to engage in military exchanges with China. The Chinese side appreciates the French side for pursuing an independent stance, regards bilateral military relations as an indispensable part of China-France comprehensive strategic partnership, and stands ready to actively deepen exchanges and cooperation between the two militaries. Wang Yi emphasized that the Chinese side is willing to, together with the French side, continue to strengthen communication within the frameworks of the United Nations (UN), the G20 and the World Trade Organization (WTO), jointly safeguard multilateralism, maintain the multilateral trading system, and push globalization to develop toward a more balanced and inclusive direction. The two sides should take the launch of China-France Year of the Environment as an opportunity to continue strengthening cooperation in ecological and environmental protection as well as tackling climate change. It is hoped that the French side will continue to play a positive role in promoting sound and stable development of China-EU relations. Philippe Étienne noted that on the sidelines of this strategic dialogue, I held fruitful talks with State Councilor and Foreign Minister Wang Yi on France-China relations and issues of common concern. The French side is willing to make joint efforts with the Chinese side to boost bilateral comprehensive strategic partnership in an in-depth manner through such mechanisms as the strategic dialogue platform. The French side is committed to deepening cooperation with the Chinese side on such key areas as aviation, aerospace and nuclear energy, and enhancing the level of cooperation in economy, trade and investment. The French side is willing to participate more actively in the CIIE. The French side advocates that the EU should participate more fully in the process of cooperation under the Belt and Road Initiative. The French side is ready to deepen bilateral military relations with the Chinese side so as to further enhance the strategic level of cooperation between the two countries. I agree with State Councilor Wang Yi's views and positions on bilateral people-to-people and cultural exchanges. As President Emmanuel Macron said, the French side expects France to become a more attractive country for Chinese students studying abroad. The French side attaches great importance to the 100th anniversary of the Chinese work-study program in France, and stands ready to promote France-China exchanges and cooperation in youth, education, culture, art, cultural relics, science and technology, and tourism. Philippe Étienne said that both France and China are committed to multilateralism, and the two sides enjoy great potential for cooperation in international affairs. The French side is willing to strengthen cooperation with the Chinese side on opposing unilateralism, the G20 agenda, implementing the Paris Agreement on climate change, promoting environmental protection and biodiversity as well as UN peacekeeping operations, and maintain communication and coordination on important issues such as the reform of the WTO, in a bid to jointly safeguard the WTO-centered multilateral trading system.